These cheesy garlic low carb breadsticks are a gluten free copycat of Little Caesars Crazy Bread. 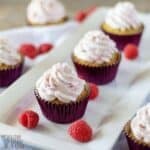 So good, you can serve them those not on a keto diet. You know a recipe is good when my non-low carbing husband and picky daughter eat them up without complaining. 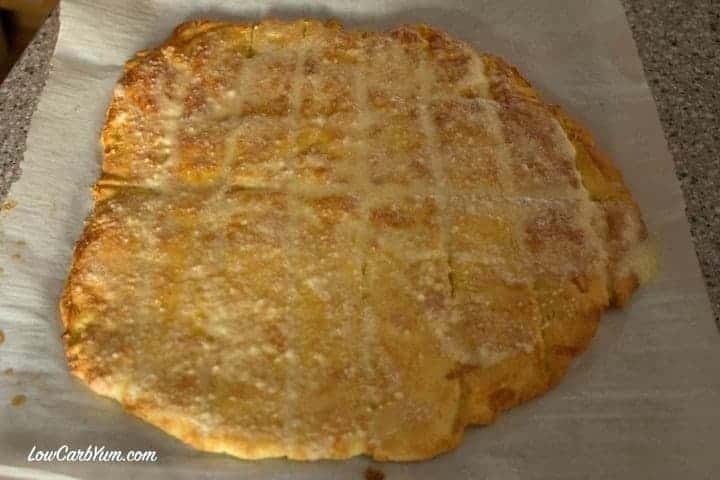 I was so impressed with the way the crust came out in my low carb pizza with Fat Head dough that I had to try using the crust dough in a copycat Little Caesars Crazy Bread recipe. 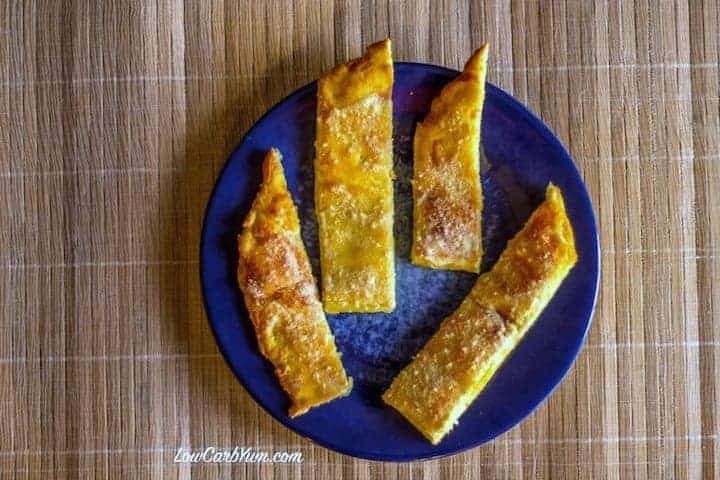 I really like using mozzarella cheese as a base for low carb breads like pizza dough, pie crust, and these low carb garlic bread sticks. There is real potential for using mozzarella to make up for the lack of gluten in these gluten free breads. 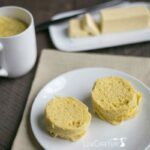 The whey protein in this recipe also gives a nice flour-like texture and taste to the bread. Not sure exactly what it is, but perhaps the whey protein allows more puff because these bread sticks are much lighter and fluffier inside than ones I made without whey protein. These garlic low carb breadsticks are almost as easy as making the ones that come in a can. 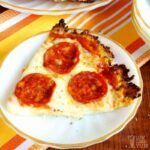 You simply melt the mozzarella cheese in the microwave for a couple minutes, then fold in the rest of the dough ingredients. The dough does seem to be a little sticky and hard to come together at first, but eventually you’ll get a ball that can be rolled out easily between parchment paper. Once rolled into a flat circle about 1/4-inch thick, the dough is cut into bread stick pieces using a pizza cutter. At this point, you spread on the garlic cheese butter so it bakes onto the top of the bread. 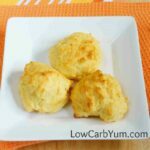 It’s really simple to whip up this easy low carb gluten free bread appetizer. 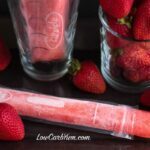 My kids can even make it themselves if they want a quick snack. 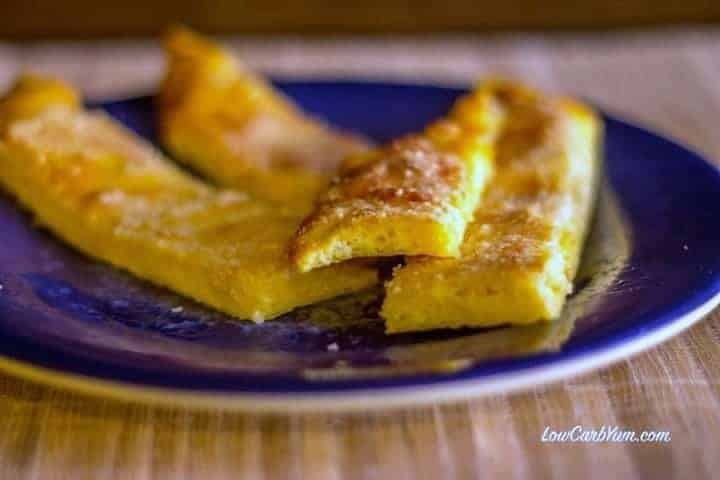 The hardest part to making these low carb breadsticks is probably rolling out the dough. I typically roll it out between two pieces of parchment paper. And, it is a little tough to get everything evenly mixed into the melted mozzarella cheese. 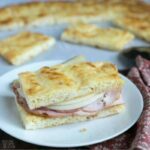 But, you don’t have to incorporate all the ingredients completely for this copycat Crazy Bread recipe. After about 10-15 minutes of baking, the bread sticks are done. 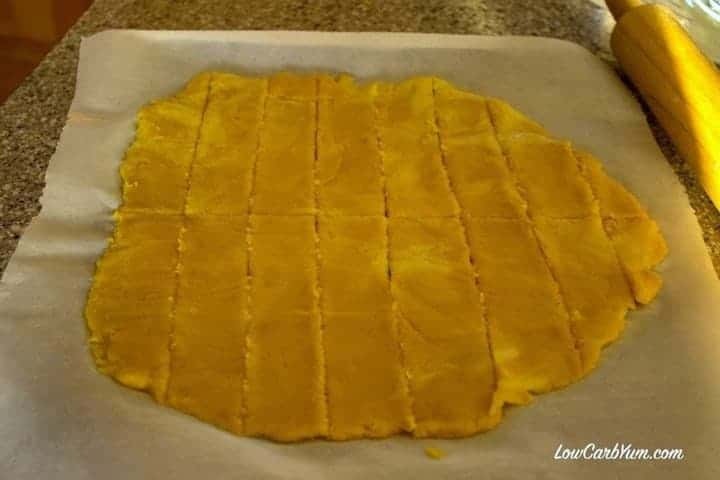 I put the dough on a regular cookie sheet pan, but next time, I may try putting the parchment paper right on a preheated pizza stonepizza stone. I think the Fat Head dough comes out better when baked on a stone. It gives a nice crisp bottom so I may just ditch the parchment paper all together as my pizza stone is well seasoned. 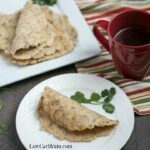 Because my family loves them, this low carb breadsticks recipe is sure to become a regular at our house. 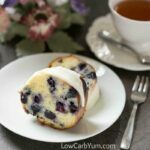 And, it’s much better than the high carb original! I tried to get a close-up of the inside so you could see how light and fluffy they were inside. I’m also thinking this dough recipe would make a great focaccia bread and possibly work as a flat bread for sandwiches. 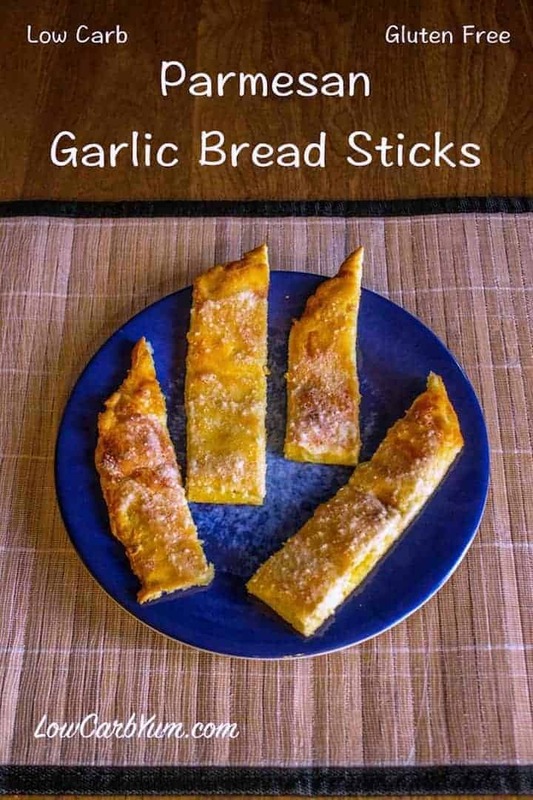 I hope you enjoy these low carb garlic bread sticks as much as me and my family. It’s a new favorite of ours. 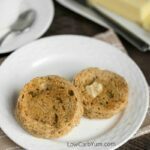 You can serve this low carb bread as an appetizer or snack. I’d also like to try it with a white pizza. No matter how you serve these, they likely won’t last long. So you may want to make a double batch. 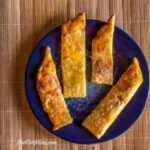 These cheesy garlic bread sticks are a low carb and gluten free copycat of Little Caesars Crazy Bread. 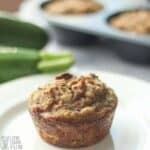 So good, you can serve them those not on low carb. Place dough ball between two large sheets of parchment paper. Using rolling pin, roll dough out to a circle about 1/4 inch thick. Peel off top piece of parchment paper. Using a pizza cutter or knife, cut dough into stick size pieces. Mix all topping ingredients together and spread onto sliced dough. Bake for 10-15 minutes or until top begins to brown. Remove from oven. Serve warm.